Some complain wildlife commissioners only meet on weekdays when most sportsmen are working their own jobs and cannot attend. For the first time in nearly three years the Tennessee Fish and Wildlife Commission will be meeting in Chattanooga on Thursday afternoon and Friday morning. Usually the TFWC, the governing body over the Tennessee Wildlife Resources Agency, meets in Nashville but a few times each year takes the show on the road. The commission met in Dayton in May of last year but last time they met in Chattanooga was October 2015. Chattanooga’s downtown Westin Hotel will be the site for the meeting. Thursday’s committee meetings will begin at 1 p.m. (EDT). The regular commission meeting starts at 9 a.m., Friday. The public is invited to attend each day. Many sportsmen over the years have complained that the TFWC meets during regular weekday working hours, requiring sportsmen to take off time from their own jobs to attend meetings. Sanders added that in an effort to provide sportsmen direct input, the commission has mandated that in the future TWRA staff hold stakeholder meetings (two per year in the four grand divisions across the state). He says those meetings will be scheduled on nights and weekends at times when most sportsmen will have the opportunity to attend. While not required, Sanders said in most cases he would expect commissioners from the respective areas to attend those meetings as well. He said that decision was just made in May and none of those meetings have been scheduled as yet. 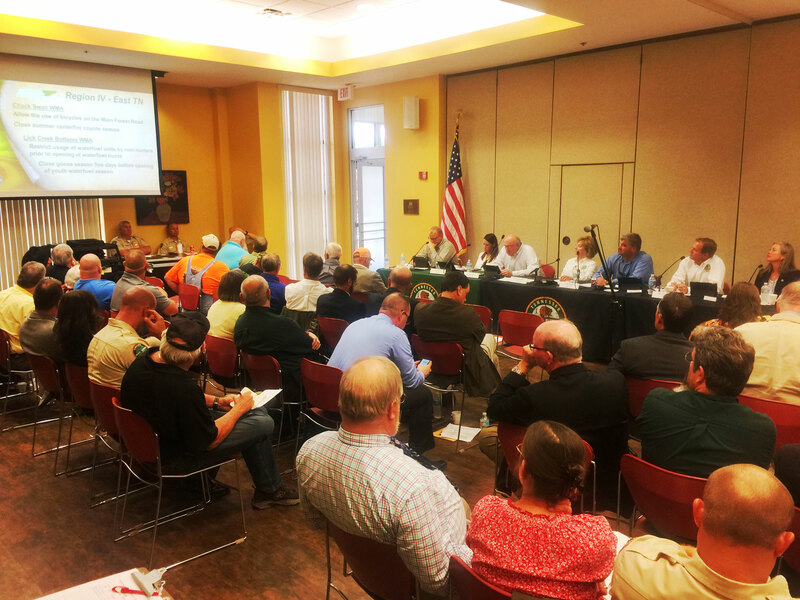 It is not unusual for Tennessee hunters and fishermen to discuss, or complain about, various hunting and fishing regulations. However most have never watched how the process actually happens. Many consider it veiled in secrecy when in actuality it is an open and somewhat transparent process. TWRA staff biologists and administrators present various issues to the 13 wildlife commissioners who are ultimately responsible for nearly all hunting, fishing and boating laws, seasons and regulations in the state. During committee meetings to be held Thursday afternoon various presentations will be made (see below). But if any action (voting) is required only the Commissioners on the various committees can vote (although all commissioners are present). CLICK HERE for Thursday’s committee agenda. On Friday morning the full commission will vote. The only action items currently on the agenda are budget expansion items including financial grants to Ducks Unlimited, Delta Waterfowl and expenditures to close oil & gas wells in Scott and Morgan counties. CLICK HERE for that agenda. Wildlife commissioners do have the prerogative to bring up new items on their own. As for information items to be shared Thursday, Greg Wathen, of the director’s office, will give a report to the commission on the progress of the TWRA chronic wasting disease (CWD) Response Plan draft. The plan will address the agency’s operation goals of preventing the introduction of CWD into Tennessee, design a risk assessment and system that will maximize early detection of the disease, minimize its impact in the event a positive CWD deer or elk is detected, and to develop an extensive communications strategy to address all aspects of outreach on CWD. CWD has been detected in the neighboring states of Virginia, Missouri, Arkansas and most recently, Mississippi. CWD is a fatal, highly-contagious disease, which affects the brain and nervous system of cervids such as deer, elk and moose. In other items, James Kelly will give an update on the progress of the deer strategic plan. Focus group meetings have concluded for the deer strategic planning document. Jason Henegar, Assistant Fisheries Division Chief, will present a reservoir habitat update. It will be an overview of TWRA’s ongoing habitat projects across the state. Fisheries Chief Frank Fiss will speak to the TFWC about the recently-caught black crappie that is a new state record and is a potential world record. Boating and Law Enforcement Division Chief, Darren Rider, will provide boating statistics from the July 4 holiday, Memorial Day, and the 10th anniversary of Operation Dry Water. Assistant TWRA Director Chris Richardson will provide a status report on the ongoing elk raffle (reported on by RheaReview.com Outdoors earlier this week). Since the elk hunt was implemented in 2009, TWRA has donated a permit to a Non-Governmental Organization to join other participants who are chosen from a computer drawing. The raffle for the permit replaces an online auction previously held to determine the additional participant. Richardson will also discuss TWRA future plans to address the user conflicts on Tennessee’s smaller rivers. Following Friday’s meeting, at approximately 11 am, TWRA officials will also hold a news briefing for all media outlets regarding the spread of Asian carp. They will be sharing information about the current distribution of Asian carp in Tennessee and their ecological and economic impact.